Home Communication Is Shame Ruining Your Relationship? Dr. Richard Nicastro, Phd, deftly illuminates the undercurrent of one of the most toxic relationship challenges; shame, often at the root of individual distress as well. He unpacks some of the defensive posturing to protect us from experiencing shame, the connections to childhood and how to take back the wheel from shame, for more loving and less vulnerable intimate connections. Of all the many causes of your day-to-day problems, you may not think for a moment that shame is among them. And perhaps you’re one of the lucky ones untouched by true shame. But shame is an insidious part of many people’s experiences, and it can often be so subtle on the surface that you may not realize it’s impacting your relationships with others, as well as your relationship with yourself. So what do we mean when we talk about shame? Everyone has been embarrassed from time to time. Actually, “describe your most embarrassing moment” is a popular interview question or social ice-breaker. Embarrassment, unlike shame, is situation-specific and transient. You were embarrassed because you tripped and fell while carrying the candle-studded cake for your husband’s 50th birthday party. Because you hadn’t planned a backup dessert, a friend had to run out and find something sweet and celebratory for the crowd, and because it was after-hours by that point, the best she could do was a variety of lunchbox pastries from the all-night convenience store. The embarrassment is because of the outcome. You didn’t feel humiliated prior to the cake spill. And the embarrassment did not last forever. You might feel the memory of the embarrassment or humiliation when you recall the event, but it’s not a chronic state for you, and it doesn’t make you question your self-worth overall. Also, the situation wouldn’t have been embarrassing if others hadn’t witnessed it (you likely would’ve been more than a little dismayed that your stumble ruined an elaborate cake, but you wouldn’t have been embarrassed if you were alone). Shame is a more pervasive emotional experience, and although it can be triggered or intensified by a particular event or situation, it was already there, prior to the event or situation. Shame exists whether or not others are there to witness it. People who experience chronic shame believe there is something fundamentally wrong with themselves. Not just that they’ve done something wrong, but that inherently, they are somehow wrong. And the way they cope with the painful shame-fueled feelings will of course affect how they relate to others. When emotions or thoughts feel too painful for us to face, we defend against them. Usually, this happens so quickly and happens below the surface of our consciousness, so that we don’t even realize we are “doing” anything. Denial, projecting our feelings onto others, acting-out in order to avoid being present with uncomfortable thoughts/feelings — these are some common defense mechanisms. While our psychological defenses are designed to help us cope with what overwhelms us, the defenses themselves become problematic, keeping us in the dark about the myriad of ways we constrict and inhibit ourselves. At some point we may need to peel back the layers of how we automatically respond to ourselves and others in order to gain deeper insights. Trying to build a relationship on defenses is like trying to build a house on shifting sands. Is your relationship being directed by “the compass of shame”? 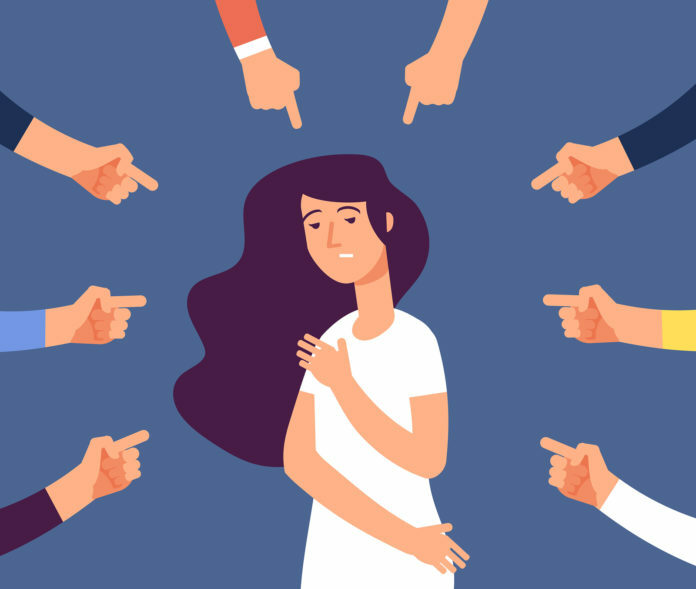 In his book Shame and Pride, Donald Nathanson, M.D., discusses what he calls “the compass of shame,” four ways people often defend against shame: withdrawal, avoidance, attack self and attack other. When you feel shame in relation to others, you might seek to distance yourself from that person or situation, sometimes even proactively, in order to prevent shameful feelings from igniting. It might be a literal distancing (like leaving a gathering early), or a more subtle form of withdrawing (such as getting quiet in a conversation you had been participating in). It can also be a more metaphoric withdrawal, like “going someplace else” in your mind. Obviously there are times when we all need to withdraw from our spouse/partner (or from friends or events), and there are times when it’s even a good idea. Maybe we’re exceptionally stressed at work and don’t have the resources for interpersonal engagement. Or maybe we were just in a huge argument with our spouse and feel like withdrawing to a quiet spot is preferable to prolonging the fight and risking saying something we may not be able to take back. But when someone is plagued by chronic shame, they might be distancing themselves from their mate more often than they realize. And their partner may have no context for why this is happening. Similarly, sometimes we want to withdraw from ourselves: maybe we are so drained that we need to watch mindless TV or sleep a morning away, just to psychically “get away” from the pressing nature of our thoughts. Again, when this is the exception and not the norm, it doesn’t represent a problem. It’s when we never feel comfortable being with ourselves that shame may be at work. According to Nathanson, people relying on the shame defense mechanism of avoidance are trying to deceive themselves and/or others; they are attempting to perpetuate the illusion of a false self that is better than the self they secretly believe is theirs. Here the “solution” to shame is to prop up a persona to show the world, one that stands in for the “broken” self you are attempting to hide. This can be difficult to recognize, since it can become so ingrained and habitual that in time, it doesn’t feel like a performance any longer. However subtle it might be on the surface, though, the avoidance approach expends a great deal of psychic energy. It’s quite draining to pretend to be someone you’re not all of the time! Think about it: If you believe others are bound to shame you (and if you believe you are inherently deserving of shame), it may feel more manageable to get there first. (“You can’t shame me, I already did it!”) Again, this isn’t a conscious choice. The mind is incredibly complex, and sometimes it’s one step ahead of us. Attacking the self allows the shame-prone person to trade the excruciating experience of shame (which might make him/her feel entirely shut-down) for the less painful, more tolerable experience of anger directed inward. However, if you’ve ever felt really angry with yourself, you know how hard it is to connect with someone else in those moments, even with someone who you know loves you. You may even be incapable of feeling or accepting that love in those moments. And you may have had the experience of wanting to get out from under the self-attack so acutely that you project it outward, even if the other person isn’t deserving of that anger. A pattern like this can wreak havoc on a relationship. Individuals who rely on other-attack to escape shame-induced wounds tend to skip attacking themselves and instead see the problem in someone else from the get-go. Sometimes the attack can be overt and vitriolic; in these cases, the shame-filled person might subconsciously be attempting to cause the victims of their attack to feel the shame that they (the shame-filled attacker) are trying to divest themselves of. If you’ve ever been on the receiving end of someone viciously putting you down or trying to blame you for something you know you haven’t done, it may feel like a stretch to re-contextualize that person’s behavior as an attempt to defend against shame, shame that likely was ingrained in childhood due to a particular facet of the parent-child dynamic. For all intents and purposes, you were the victim in that exchange, and you naturally want to protect yourself, not feel badly for the one who put you down so severely and without seeming cause. However, if you’re in a relationship with someone with this pattern of relating, and if the union feels savable, it may be helpful for both of you to work through this pattern with a professional. Because shame is usually a deep-seated response to the self and others that began in some form in childhood, it’s not something one can snap their fingers over and magically do away with. However, it is possible to learn to understand shame and thereby lessen the intra- and interpersonal damage it can do. Having the willingness (and humility) to ask whether feelings of chronic shame might be impacting our relationship(s) with ourselves and others is a courageous and important way to open the door to beneficial insights. Next articleDoes Your Marriage Need Some Peace and Quiet?